The heart is a transport system pump that delivers blood to the body through blood vessels. The right side of the heart receives oxygen-poor blood from body tissues and pumps it to the lungs where it picks up oxygen and gets rid of carbon dioxide. The blood vessels that carry blood to and from the lungs form the pulmonary circuit. The left side of the heart receives oxygenated blood from the lungs and pumps it throughout the body to supply oxygen and nutrients to body tissues. 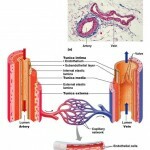 Blood vessels that carry blood to and from body tissues form the systemic circuit. The heart has two receiving chambers, and two pumping chambers. The right atrium and left atrium receive blood returning from the systemic and pulmonary circuits. The right ventricle and left ventricle pump blood through the two circuits. The heart continually pumps oxygen, nutrients, waste and many other substances throughout the body. The heart is around the size of a fist and weighs between 250-350 grams (less than a pound). Enclosed within the mediastinum, the medial cavity of the thorax, the heart extends obliquely from the second rib to the fifth intercostal space. It rests on the superior surface of the diaphragm, lies posterior to the sternum and anterior to the vertebral column. 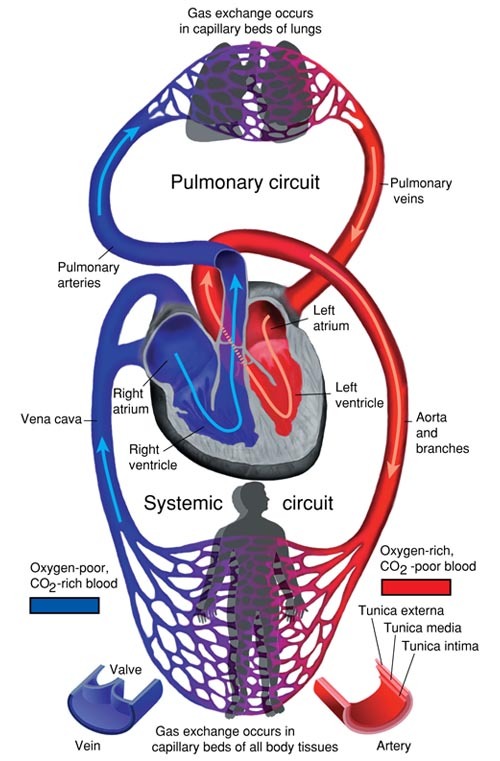 The systemic and pulmonary circuits: The right side of the heart pumps blood through the pulmonary circuit. The left side of the heart pumps blood through the systemic circuit to all body tissues and back to the right side of the heart . The posterior surface has a broad, flat base about 9 cm (3.5 inches) wide. Its directed toward the right shoulder and its apex points inferiorly toward the left hip. If you press your fingers between the fifth and sixth ribs you can feel the apical impulse that’s caused by your beating heart’s apex where it touches the chest wall. 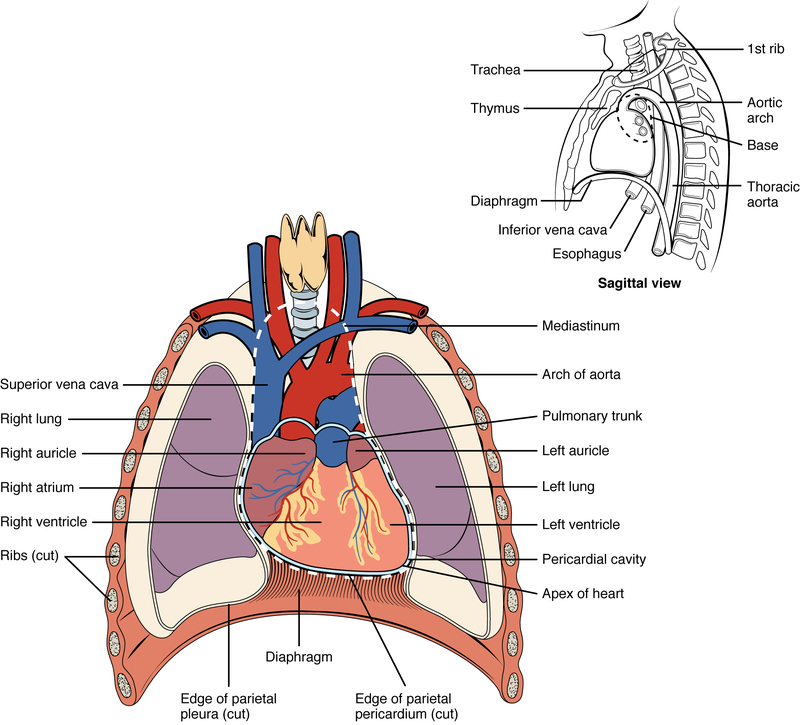 The heart is enclosed in a double-walled sac called the pericardium. The loose fitting superficial part of this sac is the fibrous pericardium. Deep to the fibrous pericardium is the serous pericardium, a thin, two-layer serous membrane that forms a closed sac around the heart. It’s parietal layer lines the internal surface of the fibrous pericardium. At the superior margin of the heart, the parietal layer attaches to the large arteries exiting the heart, then it turns inferiorly and continues over the external heart surface as the visceral layer, also called the epicardium, which is an integral part of the heart wall. Between the parietal and visceral layers is the pericardial cavity containing a film of serous fluid. The serous membranes are lubricated by the serous fluid glide past each other, allowing the heart to work in a friction-free environment. Peracarditis– inflamation of the pericardium, roughens the serous membrane surfaces. As the beating heart rubs against its pericardial sac, it creates a creaking sound that can be heard with a stethoscope. Peracarditis is characterized by deep pain to the sternum and may lead to impeded heart activity. Cardiac tamponade– when large amounts of inflammatory fluid seep into the pericardial cavity, the excess fluid compresses the heart and limits its ability to pump blood. Physicians treat cardiac tamponade by inserting a syringe into the pericardial cavity and draining excess fluid. The heart wall is composed of three layers: the epicardium, myocardium, and endocardium. Location of the heart in the mediastinum. The superficial epicardium is the visceral layer of the serous pericardium. muscle cells tethered to one another by crisscrossing tissue fibers arranged in circular bundles. These bundles link all parts of the heart together. Connective tissue fibers form a dense network called the fibrous cardiac skeleton that reinforces the myocardium and anchors cardiac muscle fibers. Without this additional support, the vessels and valves might eventually become stretched because of the continuous stress of blood pumping through them. The cardiac skeleton also limits the spread of action potentials because it is not electrically excitable. The third layer of the heart wall is called the endocardium. It is a white sheet of endothelium (squamous epithelium) resting on a connective tissue layer. It is located on the inner myocardial surface and lines the heart chambers. The endocardium is continuous with the endothelial linings of the blood vessels leaving and entering the heart. In the next section we will discuss chambers, vessels and valves of the heart.